Can an agent controlled by a reactive (state-less) controller perform tasks that seem to demand the use of memory or learning? We, together with Eduardo Izquierdo, explore the performance of a simple model agent using a reactive controller in situations where, from an external perspective, a solution that relies on internal states would seem to be required. In a visually-guided orientation task with sensory inversion (right) and an object discrimination task a study of the instantaneous response properties and time-extended dynamics explain the non-reactive performance. The results question common intuitions about the capabilities of reactive controllers and highlight the significance of the agent’s recent history of interactions with its environment in generating behaviour. In the orientation task, the agent (moving left and right only) must approach a falling object using the input from an array of 6 ray sensors. The agent must perform this behaviour both with a normal sensor configuration and with a left-right inversion of the sensor array. The task now presents a strong sensory ambiguity and a reactive controller must produce strictly opposed instantaneous responses to a given sensory stimulus. It is hard to imagine that the same controller can produce for each sensor configuration symmetrically opposed motor actions and still result in the generation of a successful catch. The plots show how this happens. 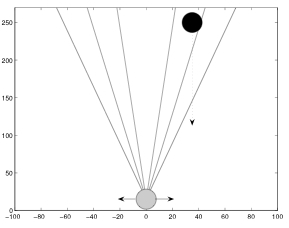 The background shade indicates what would be the response of the controller at that location relative to the falling object (clear s hades indicate a movement towards the centre, dark shades, away from the centre). It becomes clear how once trajectories are studied as extended in time, a collection of point-by-point opposed responses may still result in a catch. This work reinforces the idea that the properties of embodied action cannot be deduced directly from those of the controller by itself. Izquierdo-Torres, E., and Di Paolo, E. A., (2005). Is an embodied system ever purely reactive? Advances in Artificial Life, Proceedings ECAL 2005, 8th European Conference, Canterbury UK, M. S. Capcarrere et al. (eds), Springer, Berlin Heidelberg, LNAI 3630, pp 252-261. In a series of models developed by Peter Fine, we investigated the processes used by an evolved, embodied simulated agent to adapt to large disruptive changes in its sensor morphology, whilst maintaining performance in a phototaxis task. The agent has either one light sensor at the front or at the back but information about the sensor position is not directly available to its neurocontroller. By avoiding the imposition of separate mechanisms for the fast sensorimotor dynamics and the relatively slow adaptive processes, we are able to comment on the forms of adaptivity that emerge. 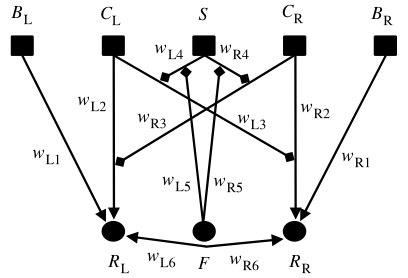 We examine the transient dynamics of the network and find different behaviours depending on the agent’s current sensor configuration, but are only able to begin to explain the dynamics of the transitions between these states with reference to variables which exist in the agent’s environment. In a follow-up study, we investigate further the role of transient dynamics by imposing constraints on the attractor structure of the neural networks. Neurocontrollers are evolved either unconstrained or limited to be monostable (i.e., to have a single attractor in their dynamics). 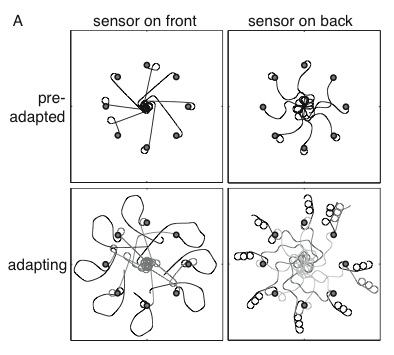 Surprisingly, even monostable controllers are capable of adapting to the two radically different sensor positions by generating different transient dynamics on coordination with environmental variables. This lends support to the importance of transients as determinants of behaviour (as opposed to a view of dynamics that looks exclusively to attractors for this role; i.e., the “one-attractor-one-behaviour” perspective). 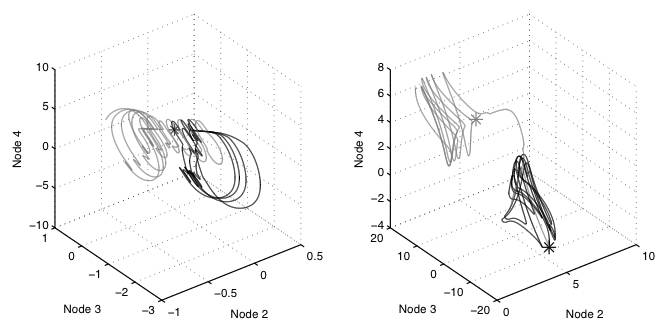 Below: Phase space plots of typical trajectories of the best evolved constrained (left) and unconstrained (right) networks. The black line represents several consecutive light trials with the sensor on the front. Gray shows several consecutive trials with the sensor on the back, beginning immediately after the sensor is switched. The stars show the attractor locations (in the absence of input), with the constrained network possessing just one at the origin, and the bistable unconstrained network having two. Both neurocontrollers achieve high fitness. Fine, P., Di Paolo, E. A., Izquierdo, E. (2007). Adapting to your body. Proceedings of the 9th European Conference on Artificial life ECAL 2007. Springer-Verlag. Buckley, C., Fine, P. Bullock, S. and Di Paolo, E. A. (2008). Monostable controllers for adaptive behaviour. In From Animats to Animals 10, The Tenth International Conference on the Simulation of Adaptive Behavior, Osaka, Japan, July 7-10, 2008. Together with Rob Vickerstaff, we use a genetic algorithm to evolve neural models of path integration, with particular emphasis on reproducing the homing behaviour of Cataglyphis fortis ants (bottom right). 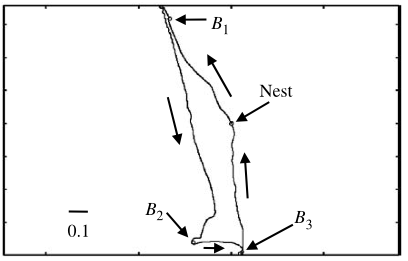 This is done within the context of a complete model system, including an explicit representation of the animal’s movements within its environment. We show that it is possible to produce a neural network without imposing a priori any particular system for the internal representation of the animal’s home vector. The best evolved network obtained (using an extended version of CTRNNs that allow the active modulation of synapses; top left) is analysed in detail and is found to resemble the bicomponent mathematical model of Mittelstaedt. 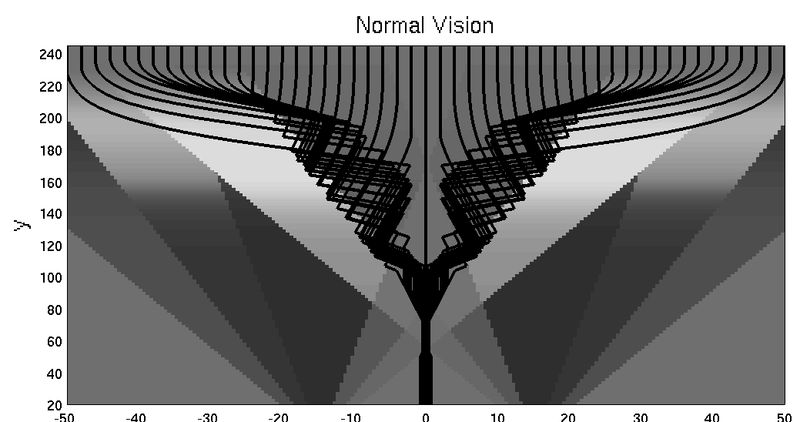 Because of the presence of leaky integration, the model can reproduce the systematic navigation errors found in desert ants. The model also naturally mimics the searching behaviour that ants perform once they have reached their estimate of the nest location. The results support possible roles for leaky integration and cosine-shaped compass response functions in path integration. Vickerstaff, R. J., and Di Paolo, E. A., (2005). 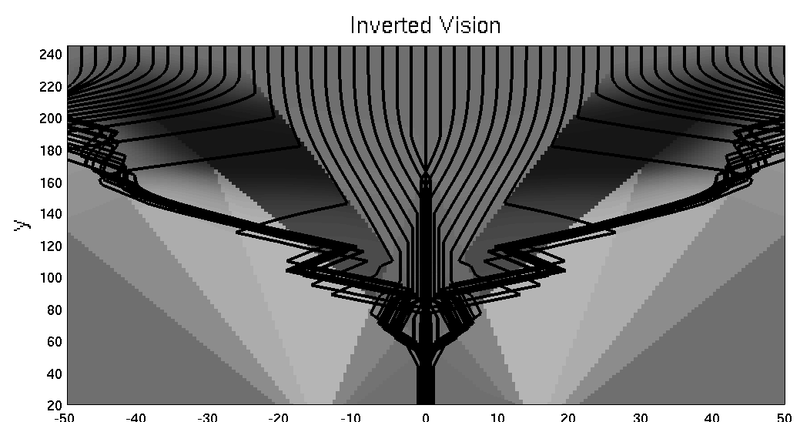 Evolving neural models of path integration. Journal of Experimental Biology, 208, pp. 3349 – 3366. Vickerstaff, R. and Di Paolo, E. A. (2008) Regarding compass response functions for modeling path integration. Adaptive Behavior 16(4): 275-276.